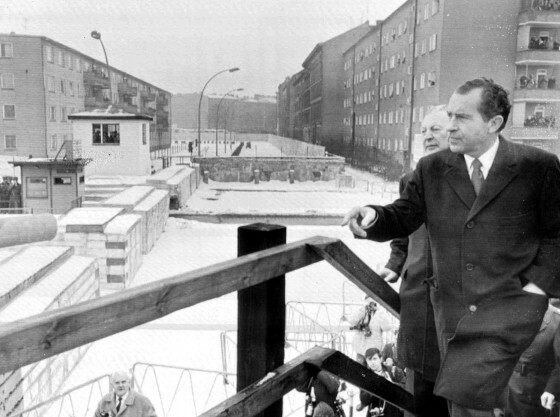 President Nixon surveys the eastern side of the Berlin Wall on February 26, 1969. This autumn marks the 25th anniversary of the fall of the Berlin Wall, a pivotal moment in 20th century history that paved the way for German reunification and the end of the Cold War era. “The fall of the Wall” that began when East German leadership relaxed border controls bridged a long divided Germany. Berlin had finally become, in President Bush’s words of foreshadowing, a place of cooperation and not a point of confrontation. Only 20 years prior, Berlin was the arsenal of East-West division. President Nixon assumed office at a time when the wall was etched in the European psyche. Far from anyone’s imagination was the dismantling of the wall, let alone any sort of relaxation in East-West tensions. Incidentally, the bond between the United States and its European allies had weakened due to the former’s entrenchment in the malaise of the Vietnam War. President Nixon entered office with a vision to reinstate sound American foreign policy. He began by bolstering U.S. relations with Western Europe–its strongest network of alliances–and in doing so, made his first official presidential visit to the region. One of his seminal stops came at the Siemans Factory in West Berlin, where he addressed thousands of workers and spectators eager to hear from a U.S. president making the first state visit to the region since President John F. Kennedy in 1961. The division of Berlin, characterized by years of arduous debate over petty legalities, administrative practices, and political and economic interests, was a critical component of the Nixon administration’s foreign policy strategy in Europe and was emblematic of what had gone astray in East-West relations. The wall had been a concrete symbol of East-West confrontation. President Nixon recognized the impracticality to which reunification of Berlin was possible at the time. Yet, he firmly stood by the view that West Berlin ought not to be treated as a separate political entity devoid of its western European ties. At the Time Magazine Man of the Year Dinner on January 22, 1990, Richard Nixon gave his honest assessment of Gorbachev. While acknowledging that Gorbachev was by far the most enlightened Russian leader of this century in Russian history, he did not deviate from his belief that Gorbachev was a true-believing communist whose ultimate goal was to save the flailing ideology. Though Gorbachev made popular amends to the Soviet Union’s approach to foreign relationships, there was no question that internally, the Soviet grasp was weakening. East Germany’s sudden turn of heart, devoid of Soviet intervention, was evidence of that. Everywhere in the world, Communism was failing. The per capita income of the Soviet people was falling, dissent was ripening across Eastern Europe, and all the great industrial powers were pitted against the Soviet Union. To save Communism from imminent failure, Gorbachev applied the only pragmatic strategy available to him: a pivot to the West. The fall of the Berlin wall was a giant leap in the direction of self-determination and freedom for Eastern Europe, but at the moment was only a means of Gorbachev’s political strategy. RN warned that Gorbachev’s pivot to the West would remove the glue that held the Western alliance together–the defense against Soviet aggression. To support its own interest of stability and freedom in Europe, the U.S. and its allies would have to be sure that the Soviet Union supported the same goal. Only then could true peace be achieved.